Mini-Nutcracker 2017 | Book a free performance at your school! Book our 20-minute condensed mini-Nutcracker 2017 performed in your school gym. It’s free!! Available to book on school days between 1pm and 2:30pm, during October and November. Contact the FVAD office at 604-826-0097 or info@fvad.ca to book your session. 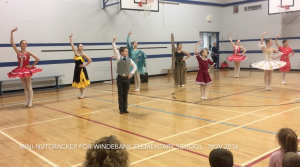 We look forward to sharing our mini-Nutcracker 2017 with many Fraser Valley school students again this year!